I recently added these pictures to my photo collection. These are workers at Gem Stone Company in Dayton, Ohio, in the late 1800s. My grandfather is the handsome one in the middle, arms folded, wearing the whitish shirt. He started working there when he was 14 years old. He eventually moved on to do bigger and better things. Now it’s early 1933. Along with three aunts and an uncle, I can find my dad; he’s the handsome one with the dimple and his eyes mostly closed standing toward the middle top. I guess the pic is too small for you to find him anyway. Oh, and one of the pianists, the one stage left, was my dad’s “intended.” But I’m kind of glad he waited to meet my mom about a year later. All these years later we still like to get a group to stand in rows and smile for the camera. Beth organized this shot by calling a “meeting.” She was pretty sure they wouldn’t show up if they knew it was for a picture. 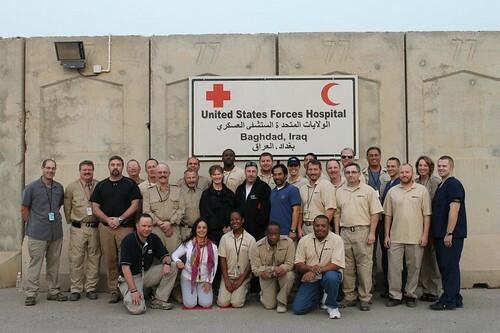 That’s my handsome son in the back row, directly below the word Baghdad, and Beth is to his left. Three makes a series, right? But I have many, many more.